Not sure which one to choose? Take a quick survey that will point you in the right direction. Mobile MANAGER Manages the workforce 24 hours a day 7 days a week : It's the most economical fleet management tool on the market. Start your. Monitor Driver Behaviorand provide instant feedback to unsafe drivers. Correct dangerous habits like speeding, rapid acceleration, harsh braking, and high speed turns in real time. Mobile MANAGER coaches the driver to operate safely and smoothly. Smooth driving behavior has proven to reduce vehicle maintenance costs and reduce wear and tear on vehicles. Lower Maintenance and Operations Costs:Brake pads, Fuel, Tires, and more. Responsible driving drastically reduces fleet maintenance costs. Real-time driver feedback minimizes maintenance costs. Onboard monitoring relays fleet information back to the office for better preventative maintenance which reduces expensive repairs and increases the lifespan of the vehicle. Mobile MANAGER Reduces Liability & Risk: Stop accidents in your fleet before they happen and reduce the company's liability. Mobile MANAGER's feedback helps coach drivers to make the right decisions and notifies management of poor OR exceptional driving behavior. Improved driving safety within the company can also lead to decreased insurance premiums. How it Works : Mobile MANAGER is proven to reduce costs through driver behavior modification. It significantly improves safety and reduces aggressive driving. Mobile MANAGER modifies driver behavior through real-time audible/visual warnings that alert the driver as they start to operate the vehicle in an unsafe manner. This immediate feedback allows drivers to correct their behavior before it leads to a crash and provides an environment in which the operators continuously learns and improves their own driving performance without constant management to employee follow-up. Mobile MANAGER typically pays for itself within 3 months of use. Mobile MANAGER easily installs in seconds on any vehicle built after 1995 (As simple as plugging a plug into a light socket). Take the Next Step with Mobile MANAGER. Mobile OFFICE 4G is used by many 911 agencies transforming Police Units, Ambulances, and Fire Trucks into a mobile office. 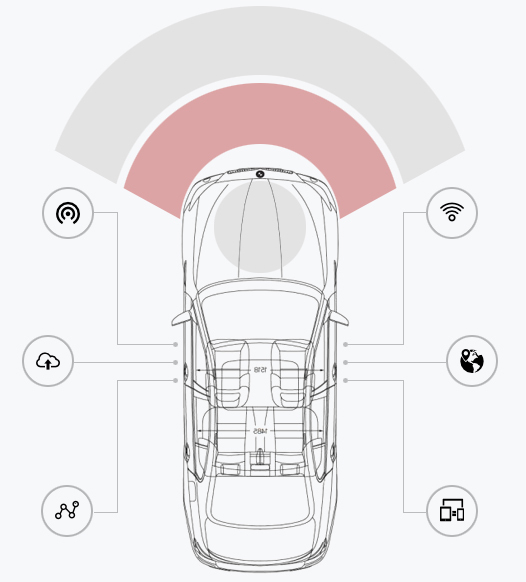 Router/Modem/WiFi/GPS/Antenna combination that transforms each vehicle into an technological efficient mobile machine. 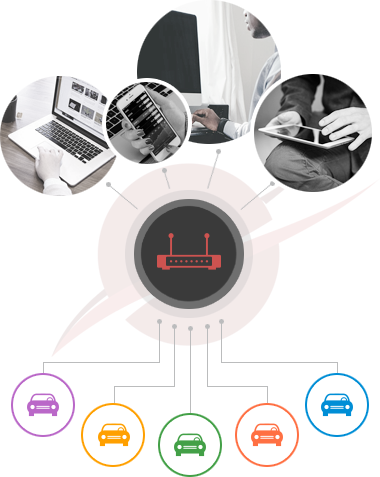 High-speed internet access for all your mobile business needs. The in vehicle hotspot allows for up to 128 devices to connect both inside and outside the vehicle. Connect your business software in your fleet of vehicles and expand your business as far as the road goes. Advanced WiFi makes the vehicles network as secure or as open as you need, suiting both passenger WiFi and secure, private networks. Connect computers, printers, scanners, or any other "typical office device" in the compartment space of your fleet vehicles. Mobile OFFICE 4G allows users to access GPS information from any device that has internet accessable no matter where you are. 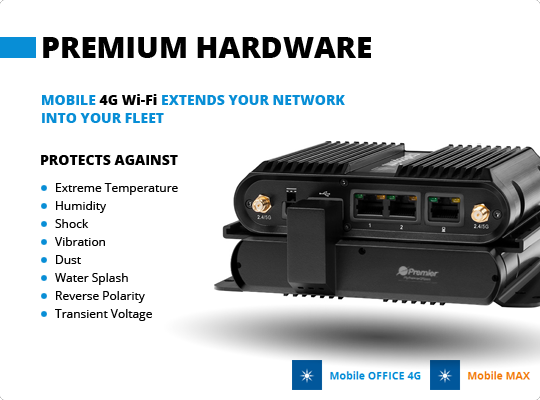 Take the Next Step with Mobile OFFICE 4G. Mobile MAX is our most powerful solution. It combines all of the features offered in Mobile MANAGER and Mobile OFFICE 4G. Mobile MAX comes with "Redundant GPS". If one system fails for whatever reason, the other GPS system is not impacted by the other system. Take the Next Step with Mobile MAX. Get full access to all geo assets and features. If hardware is purchased up-front, there are no contracts. Cancel anytime --- OR --- Lease hardware with a 2 year contaract. The amount of data that comes with the flat cost for each plan. Premier GPS works with and without additional hardware depending on your individual needs. How long does it take to install the hardware? Identify areas on the map that are specific to your business. Get auto-alerts when vehicles come or go from any particular location. Know where your most expensive resources are located. Only be alerted if resources are not where they are supposed to be. Give management the best tools to make great decisions. Easily separate divisions and only see pertinent information. Easily compare employee's habits to one another & identify areas of efficiencies. Set up a report once and have the system send reports at desired intervals. Or take it a step further, continually see live results on a webpage and only receive notifications if certain levels are not met. Account for every minute an employee is being paid for. Easily see every start and stop as desired. Stay informed with an easy to use interface on a computer, tablet, or cell phone. PremierGPS conforms to you and your needs. Easily view vehicle history for one, some, or all vehicles within a certain period of time. Choose real-time alerts sent directly to users or managers e-mails and/or cell phones. Easy to use interface on a computer, tablet, or cell phone. Valuable business information instantly available as close as the cellphone on your person. Vehicle locations update as much as every second, 130 times more frequently than the industry standard. Always know where your fleet of vehicles are and what they are doing. Track revenue by area to determine future marketing campaigns. Engineered specifically for vehicles to protect against extreme temperatures, humidity, shocks, vibrations, dust, water splash, reverse polarity and transient voltage. Simply, set it and forget it. Each vehicle becomes an extension of the office that can connect to your business network safely & securely (HIPAA & HITECH compliant with the latest encryption security). 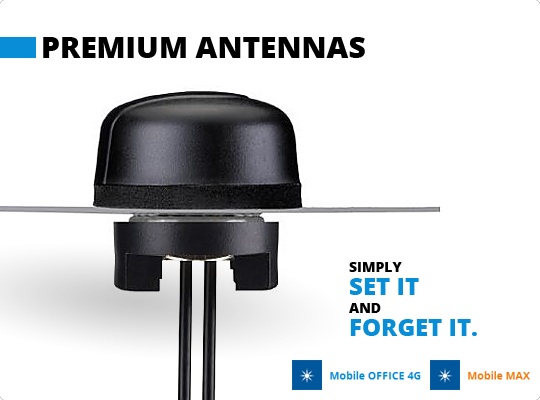 Professional antenna installation on the vehicle with the greatest range and stability. Two sources of GPS are fully redundant and create additional reporting frequency when both systems are working (cellular redundancy included). Simply enter an address and the software will give you the estimated arrival time of all vehicles and suggest the closest vehicle based on real-time traffic. Don't send a closer vehicle that will be stuck in traffic and less efficient... easily send the vehicle that will cost the least amount of payroll costs. Premier automates more processes. Don't just track your business, effectively communicate with individual e-mail and other technology. Easily see current productivity and set future productivity goals for your business. Clearly see outliers and/or report directly to a daily report card. Mobile Data Computer allows in vehicle mapping, status changes, and automated communication between the drivers and the dispatch center. Move any document anywhere wirelessly and securely. Store documents in the cloud for business needs. Readily accesible to those who need them. Fuel economy, Current Fuel Levels, Mileage, Idle Times, Check Engine Lights, Wear & Tear, Vehicle Computer Diagnostics. Automatically send maintenance reminders so vehicle maintenance is not missed and avoid expensive fleet repairs. Automatically Coach the driver on Harsh Breaking, Unsafe Turns, Seatbelt Usage, Unsafe Speeds, and Reduce Dangerous Driving Behaviors. 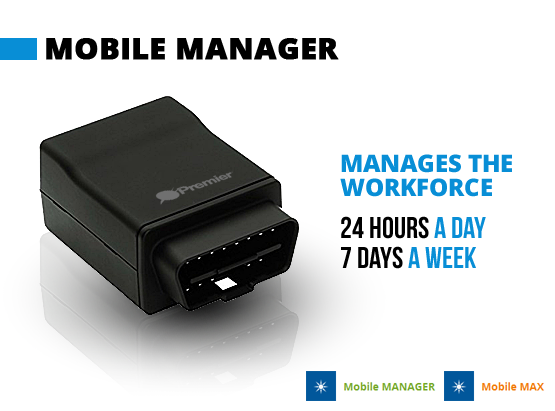 Mobile Manager acts as a Fleet Coach and provides feedback to the driver and/or the manager of the business. Mobile Manager creates automated Report Cards that help improve safety, reduce wear & tear, and eliminates wasteful employee hours while "on-the-clock". In depth reporting, analysis, and predictive solutions are available. *Additional charges and/or integration may apply to implement Custom Features. Please use the "Contact Us" form to get more information. PremierGPS works with and without additional hardware depending on your individual needs. Know where your most expensive resources are located.Only be alerted if resources are not where they are supposed to be. Software built with end user ease-of-use in mind. Customer support and user experience is at the heart of PremierGPS. Easily see current productivity and set future productivity goals for your business. Clearly see outliers and/or report directly to employees on a daily report card. Mobile Manager acts as a Fleet Coach and provides feedback to the driver and/or the manager of the business. Mobile Manager creates automated Driver Report Cards that help improve safety, reduce wear & tear, and eliminates wasteful employee hours while "on-the-clock". Do you need your vehicle to broadcast a Wi-Fi signal? Some installations are simple "Plug & Play" (plug it in yourself). Others are "More involved" (4 hours by professional installer). "Plug & Play" AND "More Involved"
Do you need a secondary back-up GPS system in each vehicle? Approximately how many vehicles total? Approximately how many people share 1 vehicle? Just like business needs change, so do our solutions. 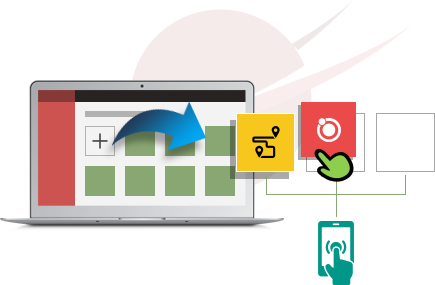 We continuously add valuable business features to all our software solutions at no addition charge. Premier automates more processes. Don't just track your business, effectively communicate with technology and get results! Surround your workforce with Wi-Fi so they can stay connected to business goals. Computers in the field seamlessly expand your office and keep everyone securely connected and accountable to all business needs. Perfect pairing of software and hardware resulting in an Extremely Reliable system! It works and works GREAT! If you don't like it we'll buy it back. New to GPS: Try it today with no commitments. Already have GPS: Keep your hardware & Request a FREE trial ! Nothing to lose! Your communications, your way! Business communication is often times the biggest hurdle in business success. At Premier, "Communication" is the foundation in all business solutions, including Premier G.P.S. Individual username & passwords allow each individual employee to receive information as desired. Desired types of communication can vary from person to person. While an e-mail may be most efficient for one person, a text message may be preferred by a different user. We offer e-mail, text messaging, phone calls, ftp, App, and fax communications. Communication will occur automatically with system defaults, but a user can easily change preferences on how to stay informed. Choose the Pricing Plan that fits you Best! Cellular Providers Fee already included. No additional cost. 1G of data included, $15 for each additional 1G, or portion thereof. Heavy data users may choose a 5G plan, add $25 per month. Instantaneously get a one page Product Overview sent to your email. 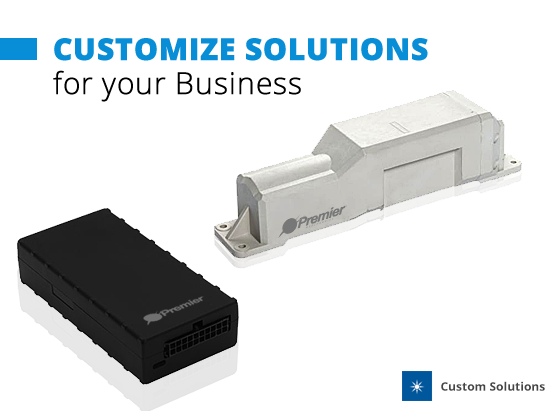 At Premier, it's your business your way. Our goal is to provide you with a Fleet Tracking Solution that makes the most sense to you and your business. Our robust packages conform to your specific business needs. Each solution provides you with a Powerful, Effective, Easy to Use business management tool. All of our software comes with the most popular settings already in place, so you can get started right away! If you like, you can further customize your solution. We've been tracking vehicles for decades. 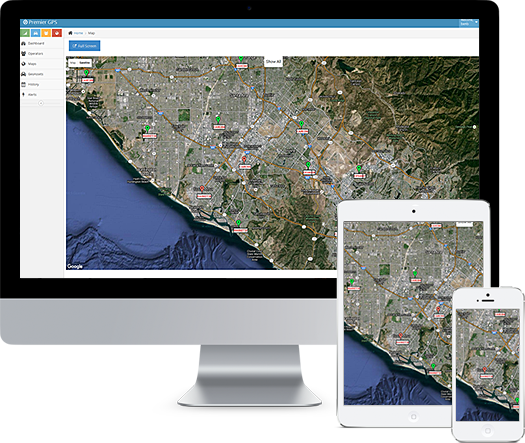 Our Fleet Tracking solutions are built from the ground up, with "ease-of-use" in mind. ©2015 MyPremierGPS.net. All Rights Reserved.
" We respond to Several Hundred 911 calls each day and recently switched to MyPremierGPS. We couldn't be happier with the features, stability & ease of use. "